I have always been partial to this particular tradition, and nothing says “I love you” quite like homemade valentines. These are fairly simple, and suitable for crafters age 10 and up. Cardstock – I purchased several pretty floral patterns as well as more traditional reds and pinks. I really like the wide variety of patterns available at Michael’s, and they are comparatively inexpensive. Ribbon in colors that coordinate with your cardstock. I chose pink and white. Candy. I used Lifesavers because they sit flat, but you can try any number of sweets. Trace or print the stencil featured below. Original full size features an innermost panel that is 2.5 inches by 2.5 inches, but you can make the boxes larger or smaller depending on the size of your candy. Cut around the solid lines. Trace your stencil onto each piece of cardstock as many times as will fit. Tip: save scraps for future projects in a Ziploc bag. There’s no sense in letting pretty paper go to waste. As with the stencil, you will cut around each box at the solid lines, leaving the dashed line intact. 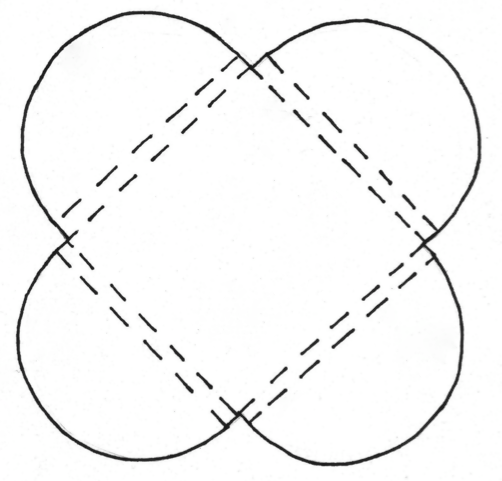 Fold each box along the dashed lines, making sure that folds are crisp and even. After filling each box with candy, tie it shut with a ribbon. Alternatively, you can use themed stickers to seal each box. Relish the amazing feeling of presenting friends and family with a homemade token of love. As always, I'd love to hear from you, so feel free to comment below, email me, or join via the Google Friend Connect widget on the side panel. Happy Valentine’s Day! This project was featured on City Farmhouse, Silly Pearl, and Simple Nature Decor. Thank you!! I think they'd also be great for party/wedding favors. Let me know if you decide to try them out for other events or holidays!
. . . and I pinned. Thank you for spreading the word, and I'm so glad you liked them! Thank you! I'm thrilled you enjoyed it. I used wrapped candy like life savers and starbursts, but the size can definitely be tweaked for any number of things. If you wanted to do cookies, fudge, and other baked goods, you could wrap them in plastic or put them in a little plastic bag first. I haven't tried it yet, but it's definitely on my radar! I think these would be super cute for wedding and party favors as well. Thanks for stopping by, and taking the time to comment! This is such an adorable idea! I'll be making some for my "Grands!" So glad you stopped by and enjoyed this post. Thank you!